EXCLUSIVE! To walk always with a flower in your hand - what could be more romantic? 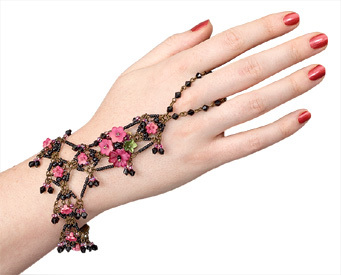 Hand bracelet forms a path of pink flowers, leading from wrist to loop around your finger. Glass beads on antiqued-brass chain. 7" at wrist. Handmade in USA by Colleen Toland.